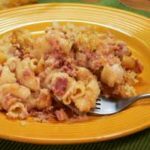 Easy to make Corned Beef Casserole, made with elbow macaroni and cream of chicken soup. Printable recipe from Taste of Southern.com. Cook pasta about 3 minutes less than called for according to box directions. Drain the pasta. Set aside. Place onion and cheese in a large mixing bowl. Add the can of cream of chicken soup. Add the cut up corned beef. Fold the beef into the other ingredients. Butter a 13x9x2 casserole dish. Pour the beef and pasta mixture into the buttered dish. Place two tablespoons of butter in a small bowl. Melt butter in microwave. Stir the half cup of bread crumbs into the melted butter until fully coated. Spread the buttered bread crumbs over the top of the dish. Bake at 350F degrees for 30 minutes or until bubbly hot and lightly browned on top. Remove from oven when done. Set on folded towel and let cool for 10-15 minutes before serving. Use your favorite shaped pasta or egg noodles. Dish can easily be doubled to make a large batch for family gatherings or pot luck dinners. Kids will love it. Keywords: casserole, easy, corned beef, elbow macaroni, pasta, hoop cheese, cheddar cheese, egg noodles, cream of chicken soup, cream of mushroom soup, southern recipes.